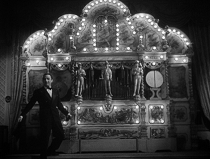 This concludes "The Big Ones," a series covering 32 classic films for the first time on The Dancing Image. 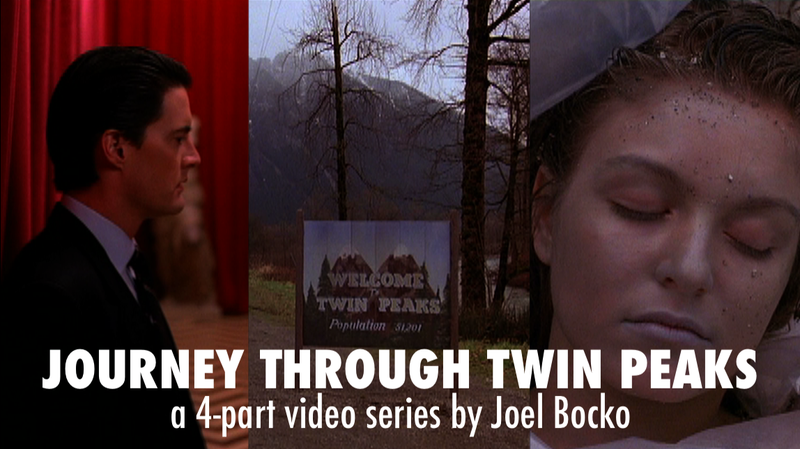 The film is addressed below, nearer the end - but, fair warning, there are many pit stops along the way. Good evening. Nearly a week ago, I wrote my final review of 2011, a piece to conclude an era of blogging, an era which began in the summer of 2008 when I sat down at the town library and addressed Be Kind Rewind and the Lumiere short films in typed prose. The page was all-white, there were no images, there was no sidebar and, of course, there were no readers, except for me. I closed that review with an admonition to myself and the invisible reader, stating that I would return to revise my first blog post since it wasn't quite satisfactory. I never did. 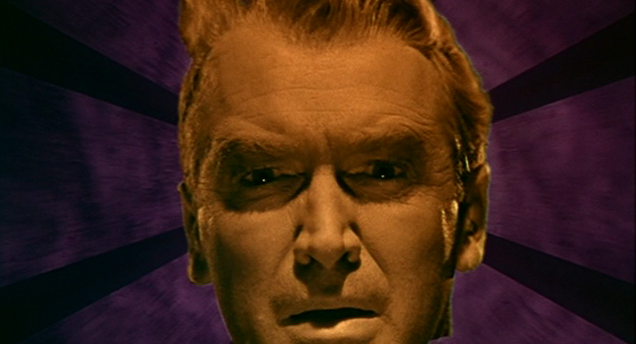 Today, however, I have deleted my "final" piece, the 32nd post in "The Big Ones," on Vertigo, one of my favorite films. The piece was terrible and while I've no doubt posted crummy pieces in the past, I feel I've mostly managed to skirt mediocrity. Not this time - so the "Vertigo" of December 31 is gone, replaced by this "Vertigo, Vertigo Variations and Watching Movies While Blogging" (the date remains for archiving purposes, but in fact I'm posting on January 7.) The irony of such tangled identities and convoluted elisions and replacements, of past and present overlapping and intertwining in both the subject of my post and the post itself, is not lost on me. 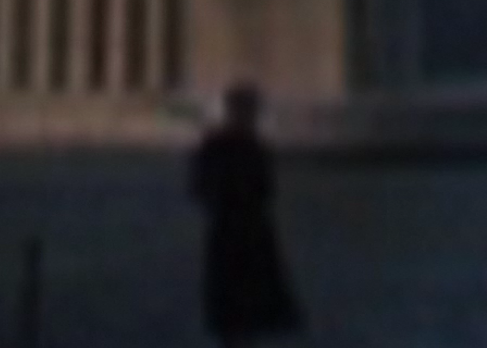 The above picture, blurry and cryptic, does not come from Vertigo. 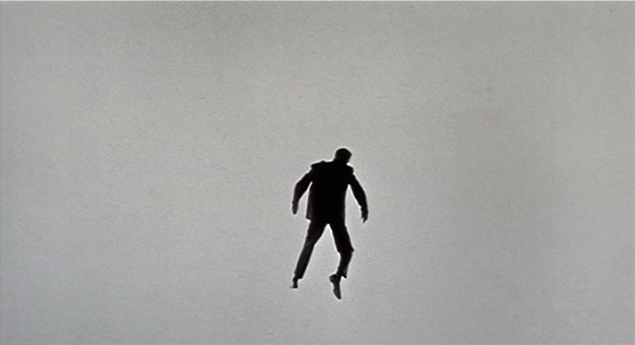 Or rather it does, but by way of Vertigo Variations, B. Kite's acclaimed 2011 video essay on the Hitchcock classic. It's a rich and rewarding project, although I feel that sometimes it veers too far towards the in-jokey, is perhaps too cool and contemplative (kineticism seems to have become passe in contemporary art cinema), and even with all its invention and originality is actually somewhat conventional - inasmuch as the narration leads the visuals rather than vice-versa. And I say that while fully acknowledging that it far outshines anything I've ever done on this blog (with the possible, and far more small-scale, exception of this). Indeed, that knowledge is part of what leads me to replace my original, by-the-numbers (and shoddily constructed) essay on Vertigo with this hopefully more engaging and appropriate "mea culpa." My blogging has been driven by two desires, among many others - the desire to express myself and the desire to order my expression. I'm not here to crap all over the second desire (I think presentation is waaay underrated in the blogosphere) but I do feel at times it's been allowed to overtake the first, ultimately more essential, desire. I have a completist streak, a compulsion to make things as "whole" as possible, which led me to initiate "The Big Ones" series in November, writing about legendary films which I'd so far avoided. I wouldn't do it again - many of the pieces are fine, but the task became a tiresome chore, undertaken at the precise moment in my life when I needed to be pushing in another direction. That's neither here nor there, of course, except inasmuch as it made the whole thing more difficult and frustrating. The silver lining in this cloud (aside from the production of an essay on Citizen Kane I'm quite proud of, and several other reviews I think hold up well) is that it gives me the opportunity to draw a line in the sand: I will never again declare a blogging project unless or until it is entirely finished. From now on, the blog exists to exhibit work I have already completed, not to witness my struggle to meet self-imposed deadlines or undertake self-willed challenges. Of course for some time - I speculate at least six months - the blog will only exist as an archive anyway. I have other fish to fry. But when I return, it will be in a different form. I have several prose projects in mind (I won't curse - or worse, guarantee - any by naming them), but they will be written casually in journals, literally outside the "box" that Blogger provides and without the "daily grind" mentality which I've needlessly inherited from criticism's journalistic legacy. More importantly, my primary projects will depart from the prose-only approach I have long felt hamstrings blogs, particularly my own. They will be formal analyses, fusing words, images, and videos, directly addressing the movies' "physical" qualities instead of mystifying the magical objects, as I feel at least my own writing tends to do. Or they will be pure video essays, preferably without narration - even less susceptible to the pitfalls of "dancing about architecture." In Vertigo Variations, B. Kite humorously relays the experience of a friend who just can't remember movie plots. 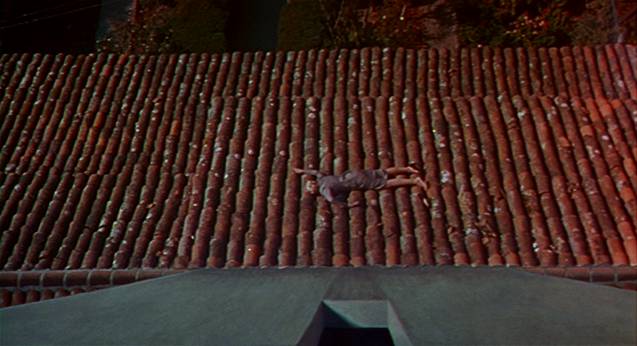 Having seen Vertigo five times, his impression of the movie remains jarred and confused, a succession of blurry images, occasionally sharp but static with story beats scrambled and emotional cues rearranged. Kite illustrates this by zooming in and blurring the frame. While this is no doubt an extreme example, I feel it reflects how many people see movies, as a series of impressions rather than a concrete experience. This approach has its virtues and its vices - and I know both because I've been inside and outside of it in my own experience. Several years ago, before blogging but after creating some short film projects, I could only watch movies as "assembled" and "arranged" bits of footage. With some directors, Godard for example, this heightens the pleasure, since they were playing with the medium and a certain self-awareness feeds into the texture and amplifies the engagement. Yet with many other films, particularly illusionistic Hollywood stories, this interferes with the most gratifying encounter, predicated on "falling under the spell" that the filmmakers have worked so hard to evoke. 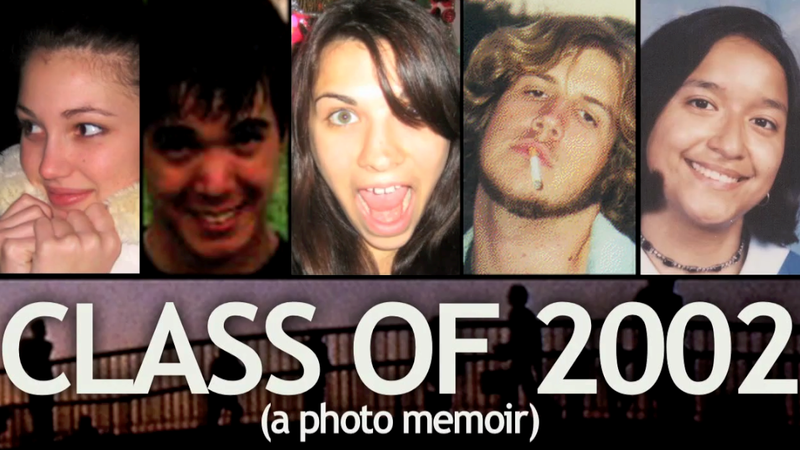 As my own filmmaking experience faded, and as I began to write about movies regularly, a funny thing happened. The spell returned. You'd think it might be the opposite; after all, once I made it my duty to analyze movies I should have been even more distanced from the "magical" side of cinema. Yet as most writers will tell you, the easiest way to write about a movie is to write about its story, its characters, even the emotional experience one has while watching it. To undertake a sharp, eagle-eyed analysis of how the particular effects are achieved is far more difficult. 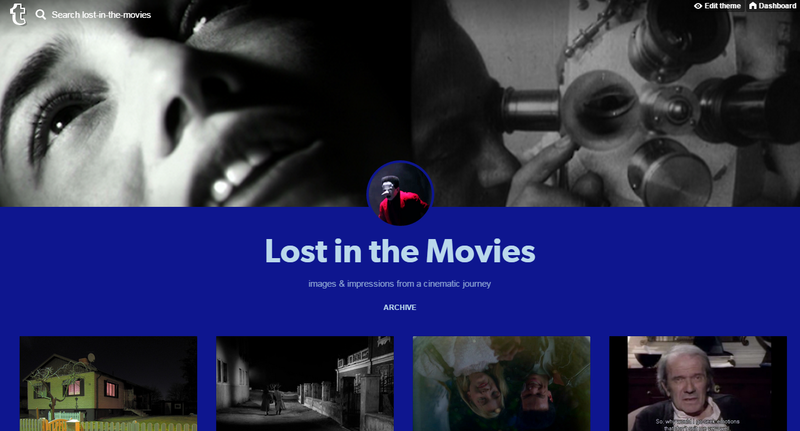 Because of my previous inclination towards formalism, I feel I was able to bring some of this sort of perception to the table, but for the most part my take on movies veered far more towards the impressionistic. At first this was a relief; while I missed the sense of satisfaction that comes from "discovering" the source of a film's magic I enjoyed being able to experience that magic better. But then something else happened. I worried about what to "say" (and early on I made a point, holding fast during some periods better than in others, to consider each essay as having a thesis, not just a "let's-write-about-everything-in-the-movie" grabbag of observations but something I could sum up in a single sentence if necessary). In doing so, the viewing experience itself became secondary to the almost Platonic ideal object I held in my mind - a concrete something I could grasp and put on the page without exhausting my left and right brain simultaneously. I began to feel like the Vertigo friend: re-assembling, not the narrative content, but the sensory experience, from half-glimpsed fleeting phenomena. Among other reasons, this is why I moved away from prose reviews towards more thematic essays, visual tributes, mixed-media approaches, and video pieces. Yet still the pull of creating "content" remained - raw material for me to organize in my various directories, to create screen-caps for, to place within series. Eventually the cart was placed ahead of the horse, and my disengagement from actually experiencing, enjoying, and understanding the movies themselves felt complete. And I suppose this climaxed with a piece on Vertigo that just didn't click - Vertigo, that uber-film, my favorite since I was a teenager, and still a great sensory/emotional experience for me. Perhaps for that very reason, it remained difficult to pin it down on the page. - Kite says that Vertigo is a film that cannot be seen, but only seen again. 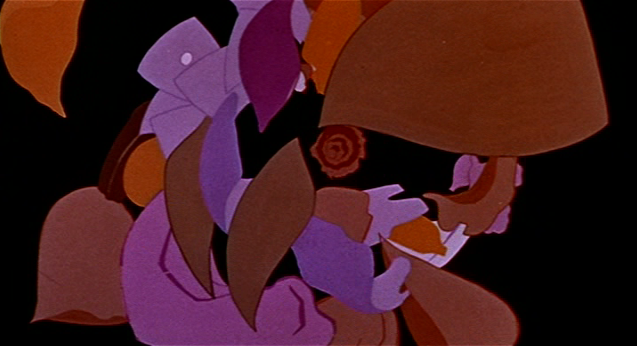 Oddly enough, I took the opposite tack in my aborted piece: every time I watch the movie, I'm drawn back into the trance of the style, the illusion of the story, as I was on first viewing. When Scotty falls in love with Madeleine, a few fleeting thoughts cross my mind (contra the characters in Mulholland Drive: "this is NOT the girl you're looking for") but for the most part I accept her as the mystery woman, simultaneously possessed and self-possessed, rather than Judy in disguise. In other words, I fall for the trick, instinctively if not intellectually, every time. - I once saw the movie screened upstairs in a library. The audience was mostly older. They laughed throughout. I had a similar experience with a younger audience - my teammates on a cross-country team in high school (the coach would screen classics on VHS tape during our lunch break, and usually they didn't go over well). My peers were laughing at the movie, while the older audience felt they were laughing with it, but in both cases - particularly the library screening - I felt disconnected from the response. Indeed, watching the movie in the library, I was more hypnotized than ever. Its tragic aura felt even more potent. Of course, the film is funny at times. Hitchcock always is. But is there any Hitchcock more brooding or melancholy than Vertigo, less tinged with tongue-in-cheek playfulness or gestures toward a self-protecting genre disguise? Yet the viewers chuckled throughout and did not seem drawn into the vortex of madness and despair. I wonder if perhaps this was because - having grown up or been young adults in the 1950s, and thus having experienced Hitchcock as the plump, sarcastic wag on television - the older audience was inclined to see Hitchcock as inherently humorous and not-serious. - To re-emphasize that point about Vertigo's exceptionalism in Hitchcock's canon, I should note that I've just completed (or will complete, with a viewing of Family Plot later tonight) a months-long retrospective of the director's work. Now I can see it as part of a continuum, but initially Vertigo was only the third or fourth Hitch film I saw, and it created skewed expectations. 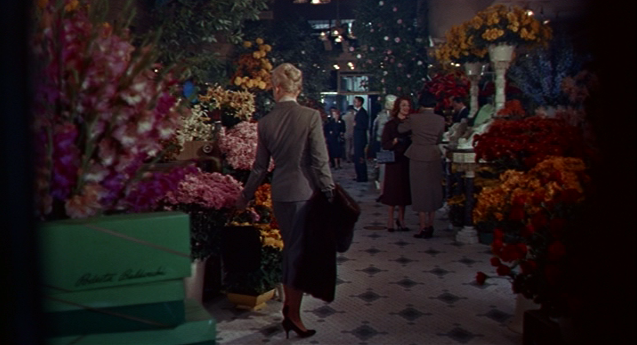 I watched Spellbound a week or two before seeing Vertigo, and that one-two punch led me to expect all of Hitchcock's work to be full of surprise endings, psychological depth, and a dark, anxiety-inducing atmosphere. When I watched Rear Window and North by Northwest shortly thereafter I was disappointed. 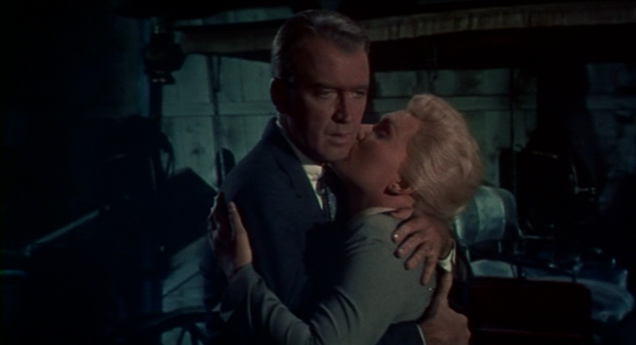 Eventually I realized their greatness but because they weren't really mysteries (there are no surprises pieces in Rear Window's puzzle, and in North by Northwest the puzzle exists just to fuel the chase and romance) and especially because they were so light in tone, they felt like letdowns after Vertigo's intensity. - Psycho was spoiled for me years before I was even old enough to see it. 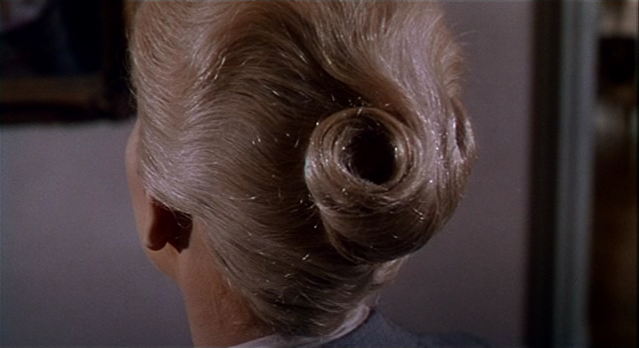 Vertigo, on the other hand, was a complete surprise. I wonder what my impression would have been had I known. Not only was unaware of the twist, I didn't even know there would be a twist. 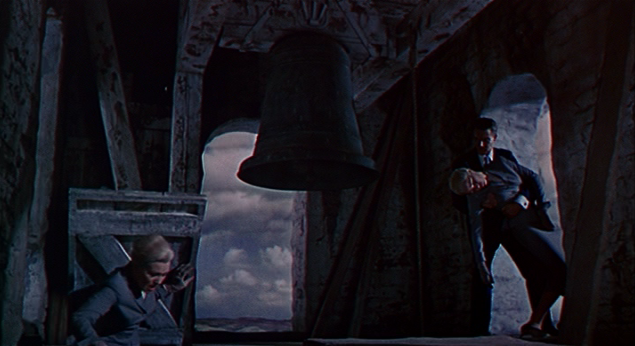 When Madeleine (the real Madeleine, as it turns out) falls from the tower, I wondered if the movie would come to an end. While hardly a satisfactory conclusion (then again, how "satisfactory" is the actual conclusion? 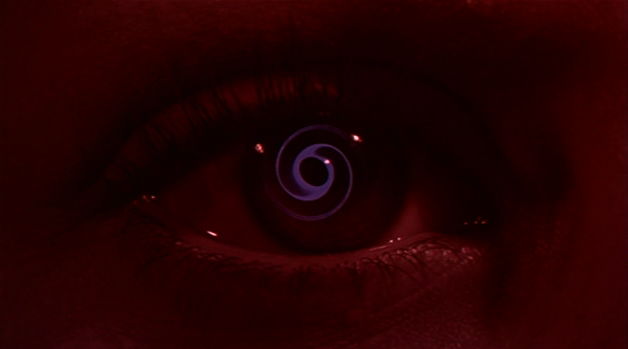 ), this event effectively wraps up the story arc established in the third or fourth scene in Vertigo - offhand I can't think of many other films that follow Vertigo's story structure: ending, and then beginning again (as Kite himself notes, sharing Chris Marker's musing that perhaps the second half is Scotty's dream). Basically, the plot ends but the story continues. And as that story continued, I found my involvement growing more and more; not only was I curious about the outcome, I was anxious about there being an outcome. That excited, anticipatory nervousness has few parallels in my film-viewing experience and must have played a big part in my love of Vertigo. Still, the film has so many things going for it that I imagine I'd have fallen under its spell regardless. 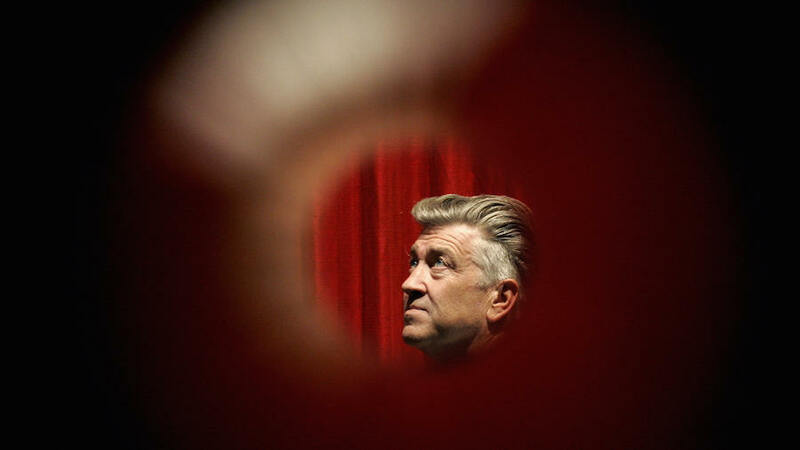 - James Stewart's work for Hitchcock is filled with ambiguity and ambivalence. In Rope, he is a smugly amoral intellectual forced to confront the logical conclusions of his own philosophy. 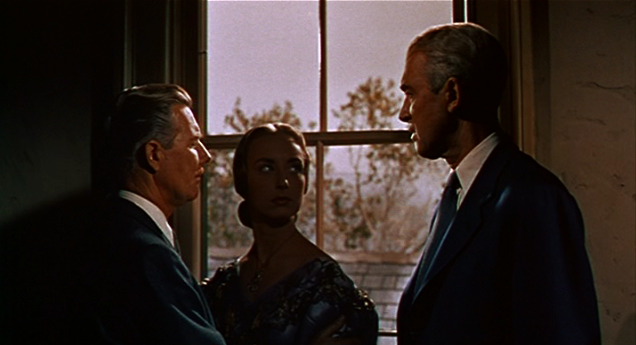 In Rear Window, he is a rather disgruntled invalid inclined to bite the hand that caresses him - has there ever been a more peculiar spurning of affection than gangly, middle-aged Stewart towards the extraordinarily elegant, eminently desirable Grace Kelly? 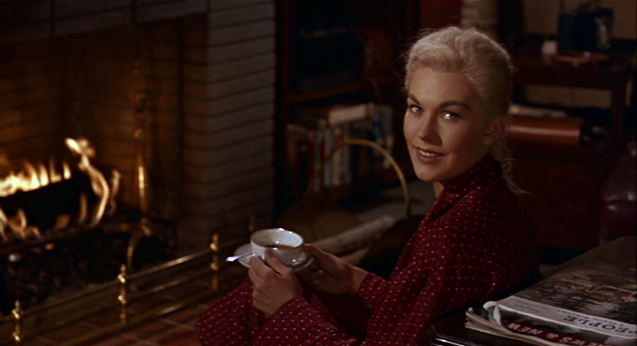 In The Man Who Knew Too Much, Stewart is ostensibly the hero yet his behavior towards Doris Day is snippy and controlling - she's the one whose instincts are right throughout the movie, yet he's constantly putting her down and trying to set himself up as the one in charge. Vertigo takes this critique of masculine vanity (concealing insecurity) a step further by unexpectedly breaking our identification with Scotty halfway through the movie. The "letter" scene is a brilliant stroke, full of storytelling risks, but very effective in not only changing the narrative, but our perspective on the narrative. It's ironic too; you'd think revealing Judy as a murderous liar would make us less sympathetic to her, but instead we begin to see Scotty as selfish and manipulative. Perhaps we know that his pitiful desires hinge on distorted fantasy rather than actual memory, even if he himself doesn't. In a way, Stewart goes from being the duped hero (the regular-guy protagonist of so many Hitchcock films) to the complex, tormented villain (Hitch always had a desire to make the bad guy the most interesting character in the movie). It's a transfiguration almost as amazing as that which Madeleine/Judy undergoes. 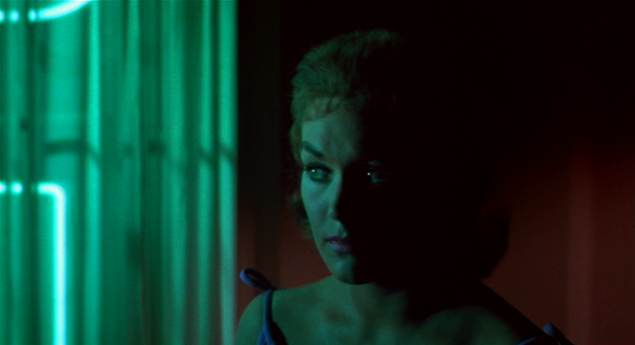 - Hitchcock was disappointed and frustrated by Kim Novak, but I think she's perfect. The scene solidifying this impression for me is the one after Scotty rescues Madeleine from the Bay, when she emerges into his apartment clad in a red bathrobe with her hair still a bit wet and tangly from the water. What's so perfect here is that we have a cross-section of the ethereal and the approachable. I think this is the moment when Scotty really falls in love with her, because she's no longer the removed goddess, even though she retains some of that aura. What's so touching is the suggestion that, for all his megalomania and obsession with the physical (he seems to think that recreating her appearance is enough to evoke her soul), underneath the layers of lust and idealization are the embers of actual love for another human being - even if Scotty's wrong about who that human being is. The fireplace sequence, with its fusion of the homey and the romantic perfectly captures the first flickerings of these embers. Ghost and flesh intermingle, fleeting yet just as actual - in the moment - as the smoke from that fire. That's all. See you on the other side. 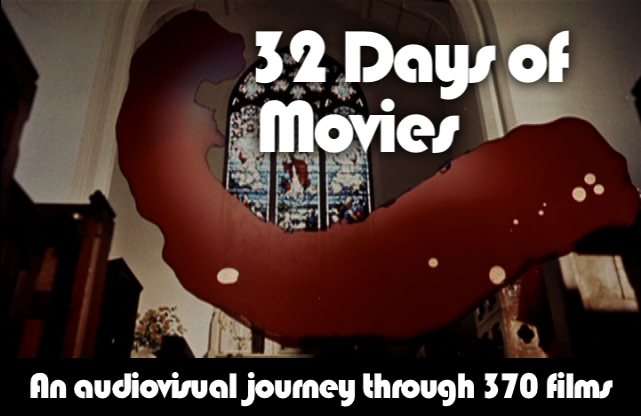 Vertigo appears at 3:15 in "The Wide View", a chapter in my video series "32 Days of Movies".